READING, Pa. – Homestanding Albright held Lycoming without a touchdown as the Lions (1-1) Middle Atlantic Conference) defeated the Warriors (1-2, 0-2 Middle Atlantic Conference) 17-3 in the 66th Annual Pretzel Bowl game at Shirk Stadium on Saturday afternoon. Albright, who snapped a two-game skid, held the Warriors to its lowest point total in Reading since 1976 and forced four fumbles. Dickerson caught five passes on the day. For Lycoming, senior quarterback Chase Whiteman threw for 212 yards on 16-for-39 passing. Freshman defensive back Korahn Williams was the Lycoming MVP of the Pretzel Bowl, making four tackles but forced and recovered a fumble and had an interception. Defensively, senior linebacker Kevin Mason had 11 tackles including ten solo stops for Albright, while Lycoming got seven stops from junior cornerback Johnathan Zedar and junior safety Mike Ward. After a scoreless first quarter, which saw Lycoming fumble the ball as the Warriors were going in for a score, a 24-yard chip shot field goal from Jamie Fisher gave Lyco its lone lead at 3-0 with 11:07 left in the half. 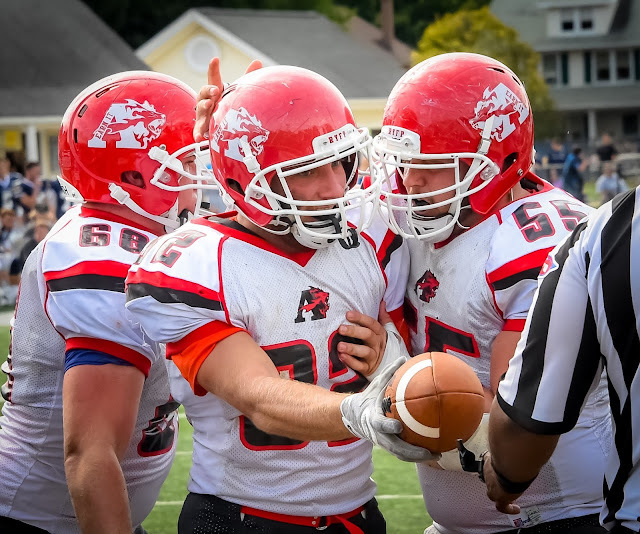 Albright would then score back-to-back touchdowns, with Monroe getting the Lions on the board with 7:41 left in the half on a 10-yard run. Right before halftime, Albright would take a 14-3 lead when Williams caught a 32-yard pass from Vignola with 1:01 left. The lone score in the second half was a 44-yard field goal from Kevin Goetz with 13:04 left to go in the game, making the final margin 17-3. Albright played ball control, holding the rock for 35 minutes in the game. The Lions also held Lycoming to 4-of-14 on third down conversions. The Lions head to Delaware Valley next week.